Amazing Cat Litter beats them all! Historically, cat litter was purchased by the pound….the more pounds, the longer it would last. Amazing Cat Litter has changed all that. 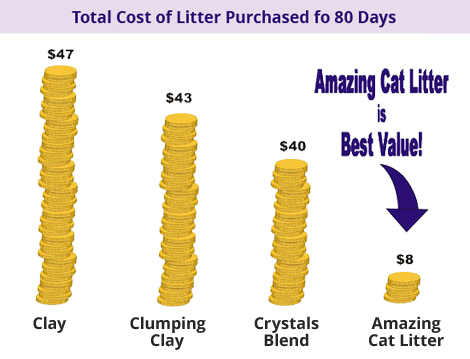 Amazing cat Litter is so efficient, that is only takes 8 lbs* by weight to do the job of 224 lbs of clay, 112 lbs of clumping, or 93 lbs of blended litter (based on manufacturers suggested use instructions on packages). 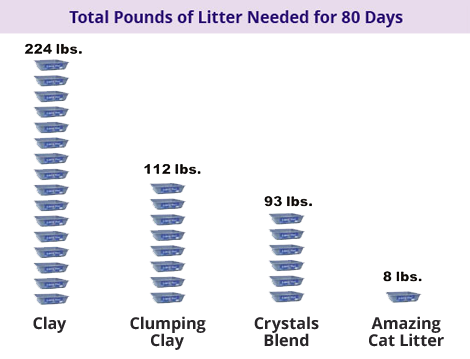 The benefits to you….1) big money savings, 2) less trips to the store to stock up, 3) less material in landfills, and 4) no more back breaking lifting of heavy litter bags….. and….you get the best odor killing litter on the planet! *Results may vary based on litter box location, climate, humidity, and individual cats.